Congratulations to Tammy Y., the winner in Janie's giveaway. Thank you to all who participated. 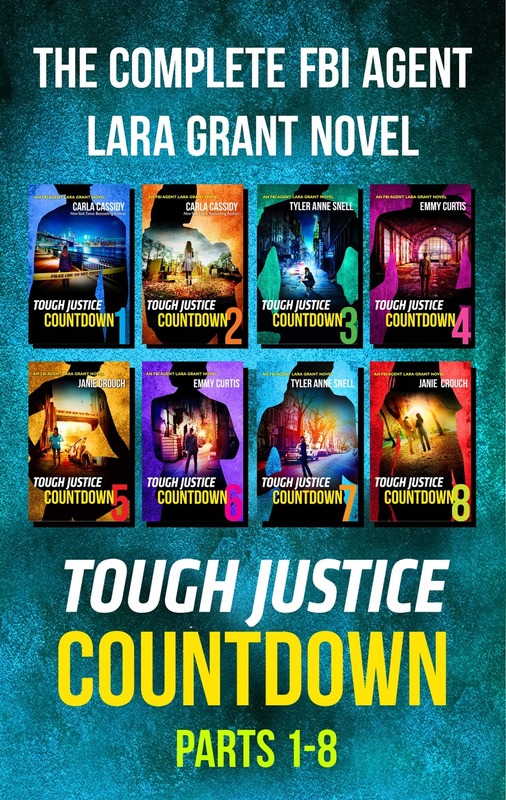 Harlequin is bringing back FBI Agent Lara Grant and her team at the Crisis Management Unit to catch a killer who forces his victims to make the ultimate choice… their ugliest secrets publically revealed or a stranger dies. 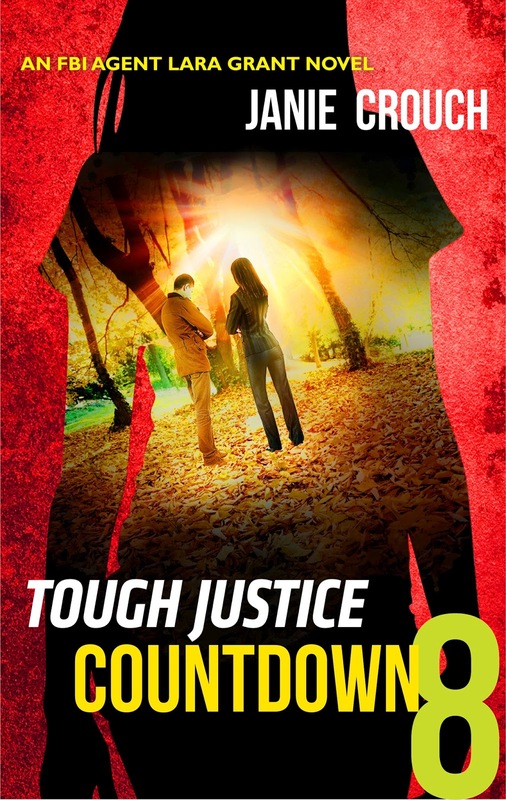 Written specifically for binge-reading, TOUGH JUSTICE COUNTDOWN, was developed like episodes of your favorite serial drama. One of the TJC authors, Janie Crouch, joins Just Romantic Suspense to talk about writing a serial and suspense in general. 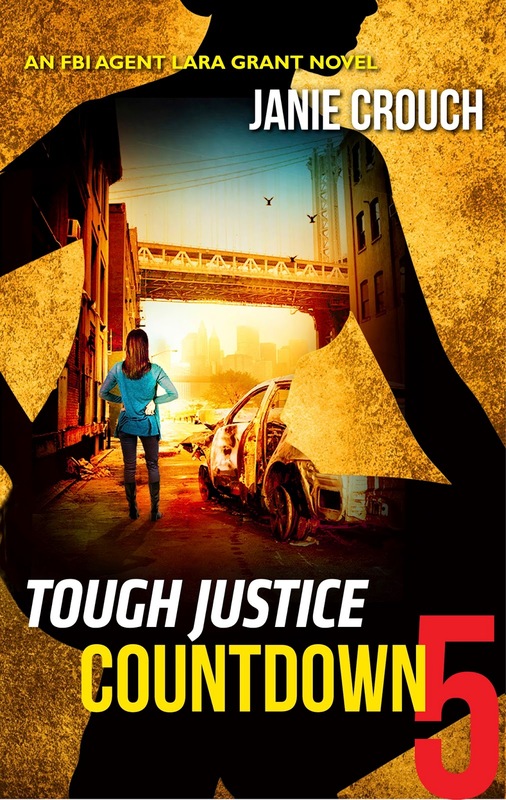 Janie wrote Episodes 5 and 8 of TOUGH JUSTICE COUNTDOWN. How’s writing this serial different from writing your other books? The serial was different for me because we (the four authors) were bound by the series “bible” we and the editors created. I couldn’t just change something and go in a new direction in Episode 5, because it would directly affect all the authors/episode that came after. But having the creative force of many minds more than made up for any limitations! What inspired you to write in the suspense genre in the first place? I love action and adventure! I’ve lived and traveled all over the world, have participated in many different types of races (triathlons, obstacle races, marathons, 200-mile relays), and with four kids am constantly on the go. So I think that when it came to writing, suspense was just a natural fit for me. All-time favorite thriller/cop series or movie and why? So hard to choose! Probably my all time favorite thriller/cop series was the original season of 24 with Kiefer Sutherland. Talk about a binge-worthy show! I loved how it embraced the concept of “real time” and wasn’t afraid to build on the prior episodes. You never knew who was good and who was bad and who would end up dead. Excellent concept, writing, and acting. What books/authors have most influenced your writing? Without a doubt, Linda Howard has most influenced me as an author. Her books (especially her early ones) were the perfect blend of romance, suspense, and thriller. I have read most of her books multiple times. Cynthia Eden and Elizabeth Heiter are two of my current favorites. I think inspiration is everywhere to be found. I read as much as possible (all genres) and not be mindless in any of my film/TV viewing. I’m constantly watching shows and thinking about why they do or don’t work and what I can take and apply in a new way to make it unique. TOUGH JUSTICE COUNTDOWN IS AVAILABLE NOW. FBI Special Agent Lara Grant thought that she’d put her past behind her—finally—with her last case. But now a serial bomber is targeting Manhattan’s elite power players, offering them a choice between saving hundreds of lives or seeing their darkest secrets exposed. Lara is working with the Crisis Management Unit to stop the bomber, but how will she react when she’s the one who has to choose between truth…or death? 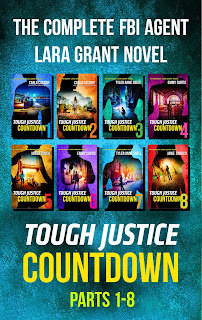 Janie is giving away an e-copy of all eight episodes of TOUGH JUSTICE COUNTDOWN to a JRS reader. Just name your favorite thriller/cop TV show or movie in the comments below. Award-winning author JANIE CROUCH recently relocated from Virginia to an American military base in Stuttgart, Germany with her hubby and four kids. Unfortunately, ihr Deutsch ist nicht sehr gut zur Zeit. She loves travelling, adventure racing, and movies of all kinds. Check out her #OmegaSectorBooks, available now. Giveaway ends 11:59pm EST Feb. 6th. Please supply your email in the post. You may use spaces or full text for security. (ex. jsmith at gmail dot com) If you do not wish to supply your email, or have trouble posting, please email maureen@justromanticsuspense.com with a subject title of JRS GIVEAWAY to be entered in the current giveaway. NCIS! Gotta have my Gibbs fix each week :) thanks for sharing! I like to watch Criminal Minds, it always has very interesting storylines. The whole set sounds awesome, the 5-8 of course, but also the 1-4. In response to your Q: I love-love-LOVE: Bosch! My current favorite TV police shows are NCIS (original) and Blue Bloods. Very different in style, approach, and content, but good. This sounds like it will be a thrill ride of a series. Tough to only name one show; I love Criminal Minds, Major Crimes, NCIS, Law & Order... among others. I watch a lot of TV = Lucifer, Lethal Weapon, Blindspot, Elementary, Hawaii 5-0, Blue Bloods, Blacklist *already said) Gotham. The Flash, Arrow. APB, and cancelled shows Castle and Justified.